Whether you like singing on the Internet or Karaoke, or the host of a popular podcast, or just someone looking to chat over Skype, you need a microphone that allows you to be heard louder and clearer. Luckily, this high quality condenser microphone connects with a 3.5mm XLR microphone cable, it is a professional condenser mic, is just the thing for someone looking for an affordable and easy-to-use. Simply plug the 3.5mm interface into your PC or Mac device and you're ready to go. Built-in double microphone, Built-in double microphone and high quality condenser microphone chip, increase sensitivity, filter out background noises, and louder and clearer sound voice. Volume Adjustable: with a volume control dial on the edge of the mic, easily adjust microphone input volume conveniently, no need to adjust computer sound. With a folding tripod, you can fix the microphone on the desk conveniently with the clip which is 180°rotatable, when you are singing or chatting through Internet. The microphone is small and lightweight, you can hold the condenser microphone on your hand, silicone material with the handle will provide you best hand-feeling. Just this Condenser Microphone, you won't be disappointed. Built-in double microphone and high quality condenser microphone chip, increase sensitivity, filter out background noises, and louder and clearer sound voice. 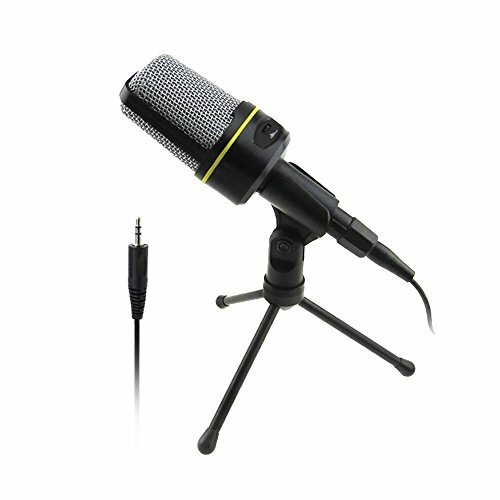 Connect with a 3.5mm XLR microphone cable, it is a professional condenser mic, widely used in professional studio podcast or broadcast. With a folding tripod, you can not only fix the microphone on the desk with the 180°rotatable clip, but also can hold the mic in your hand which will provide you best hand-feeling. 3.5mm plug fits for all kinds of PC. Ideal for network chatting, Facetime, Youtube, Skype, MSN, Yahoo Recording, singing online or karaoke.【Warranty】:VAlinks provide 12-month warranty for any disatisfied products,any problem feel free to contact our service team directly for help.